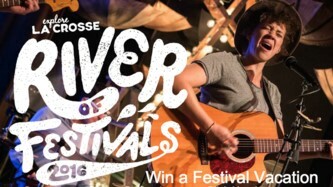 Explore La Crosse , Bicycle La Crosse, Hampton Inn Lacrosse/Onalaska, and Wyatt Bicycle are giving away a new bicycle and a vacation to take part in the La Crosse Area Bicycle Festival! Prize includes: Dritless Fatbike. Maximum ARV of all prizes: $1700. This Sweepstakes ends on 08/02/16 and you can ENTER ONCE to win.